What’s in the box? Phantom 4 Pro quadcopter, Intelligent Flight Battery, charger, four pairs of propellers, remote controller, power cable, gimbal clamp, USB On-the-Go cable, microUSB cable, carrying case. Is the Phantom 4 Pro ready To Fly? Yes, with only non-soldered connections needed. Do I have to worry about rolling distortion when shooting moving subjects or flying fast? The Phantom 4 Pro’s mechanical shutter prevents rolling distortion. Can the camera shoot 4K video? Yes, 4K video @ 60fps. What is the camera’s best still photo resolution? 20MP shot in 3/5/7/10/14fps bursts. Is the camera capable of slow motion? The 60fps recording speed in 4K video allows slow motion that is smooth, professional-quality and TV-ready. Does the camera lens zoom? No. The lens is a fixed length. Close-ups can be obtained by flying closer to the subject. Is the camera lens interchangeable? No. Are the gimbal and camera removable? No, they are permanently mounted. Will the Phantom 4 Pro deliver results that I can use as a professional videographer who shoots weddings, commercials, TV news features and webpage video? Absolutely. Aerial 4K video shot from a P4P is hard to separate from 4K video shot from more expensive drones. The 3-axis gimbal stabilizes it, and the 60fps rate lets you edit for slow motion. Video output is improved at 100mbps, up from 60 on older models of the Phantom 4. H.265 capability also is built in. 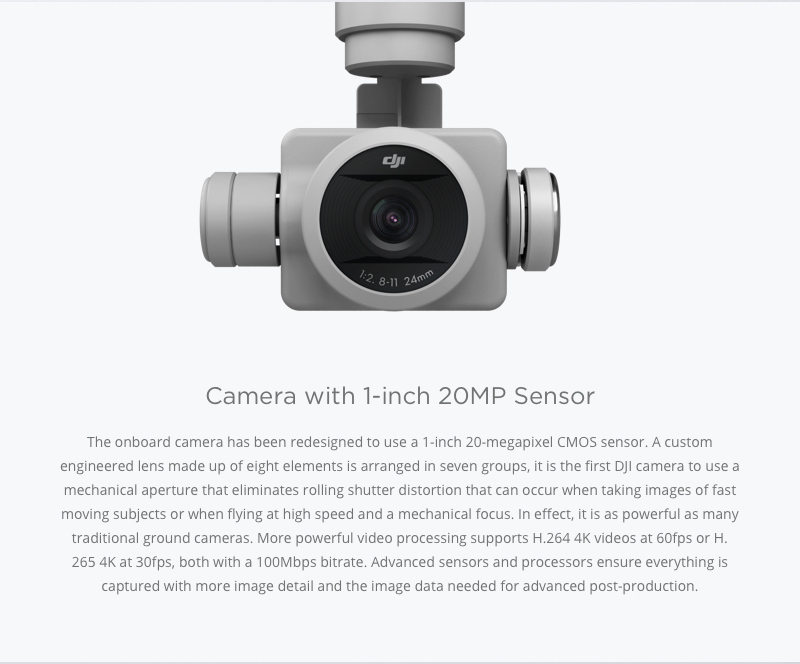 The field of view is 84 degrees, compared with 91 degrees on the Phantom4, and the dynamc range is greater, improving detail. 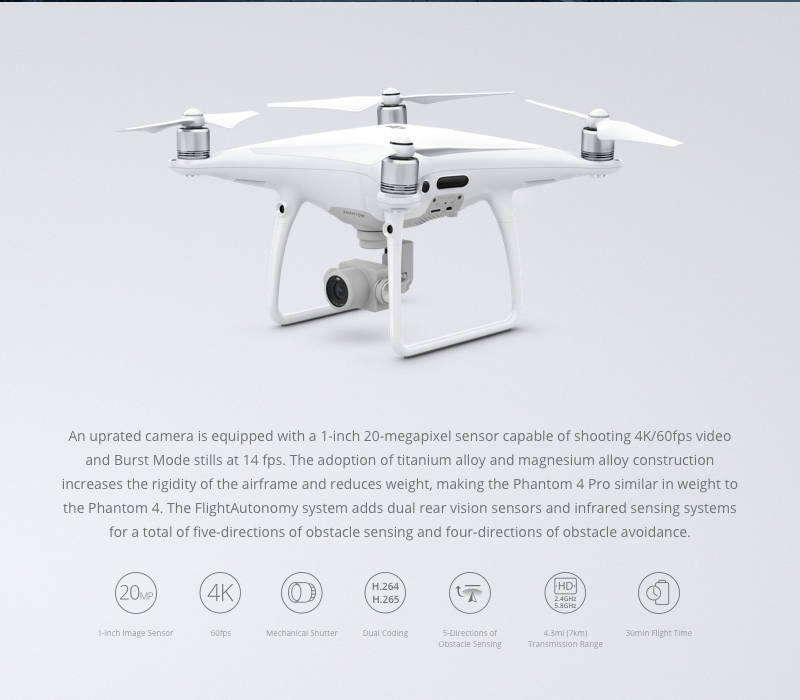 Is the aperture fixed as on earlier Phantom 4 models, or is it adjustable? The aperture is manually adjustable from your remote controller, from f2.8 down to f11. Filters also are accommodated. What is the maximum ISO setting? ISO 6400 on video, and ISO 12800 on stills. Am I limited to the 16GB of memory on the included micoSD card? You can insert a card with a maximum memory of 128GB. 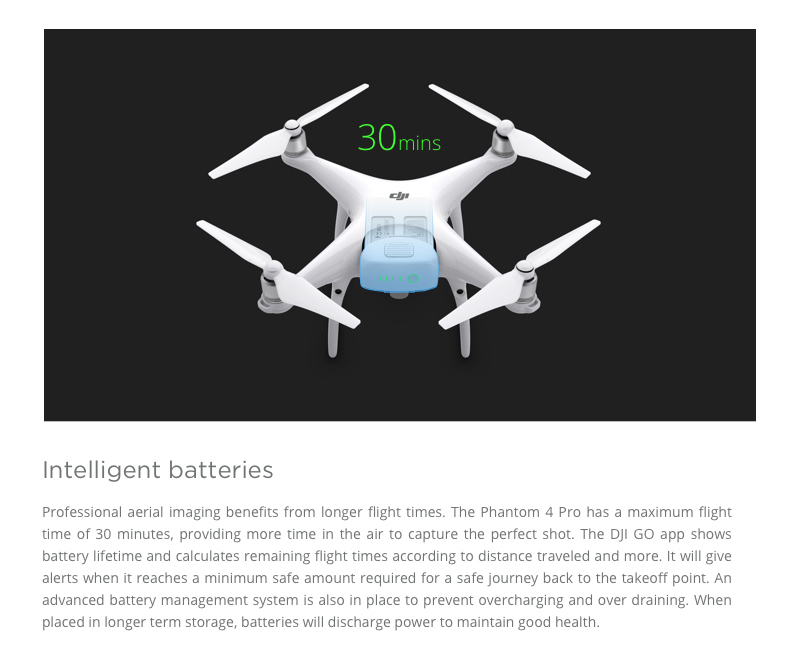 How much time will I need to adjust to flying the Phantom 4 Pro? Take all the time you need by using the Beginner Mode, then progressing as your skills improve and you learn the aircraft’s flight traits. Obstacle sensing works in how many directions? Five: front, back, sides, bottom. Obstacle avoidance works in how many directions? Four: front, sides, back. Can I fly in rain or snow? No. Can I fly in cold weather? Down to 32 degrees. How fast can I fly? Up to 45 miles per hour in Sport Mode. 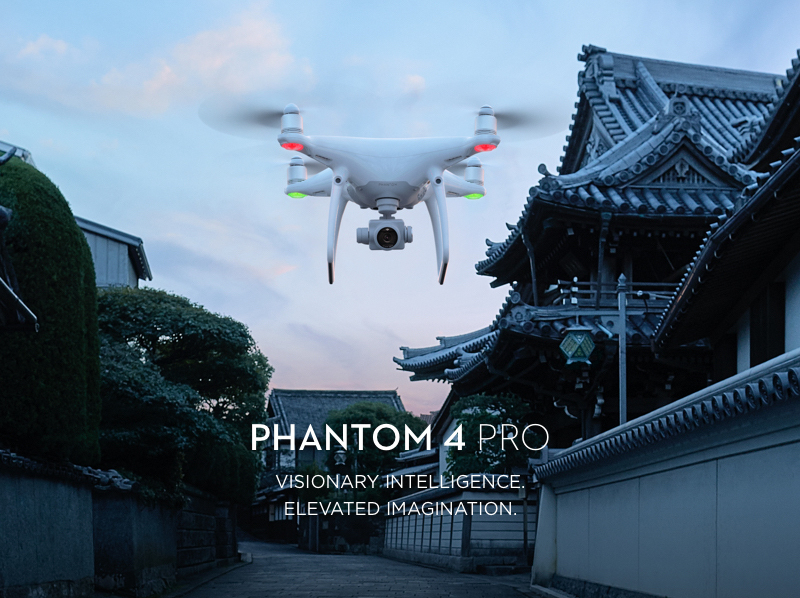 The Phantom 4 Pro can accelerate at more than 19 feet per second and descend at nearly 13fps. 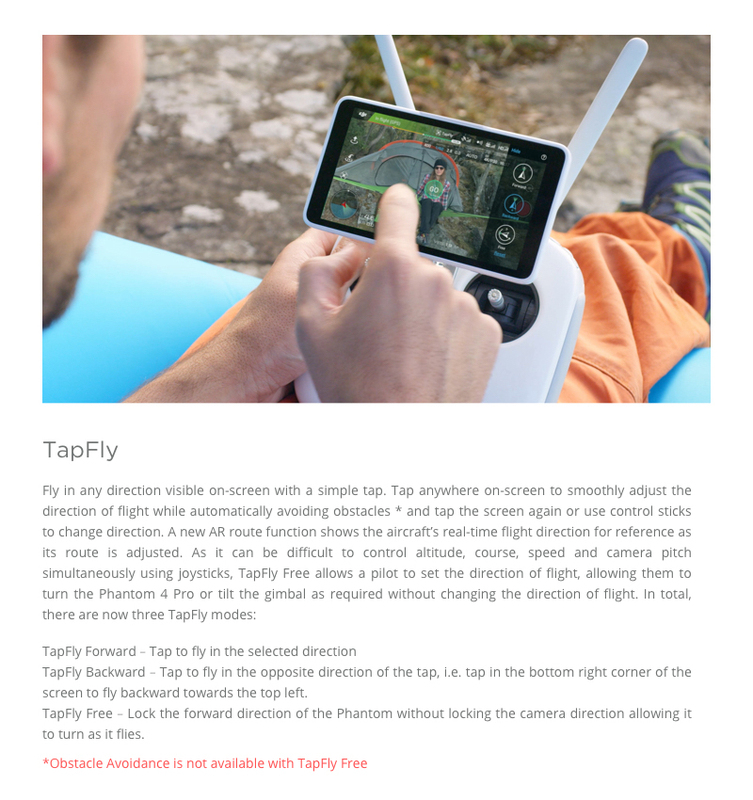 How does TapFly work? Just tap an area on the screen and the drone will go there, using obstacle avoidance to arrive safely. Explain ActiveTrack. 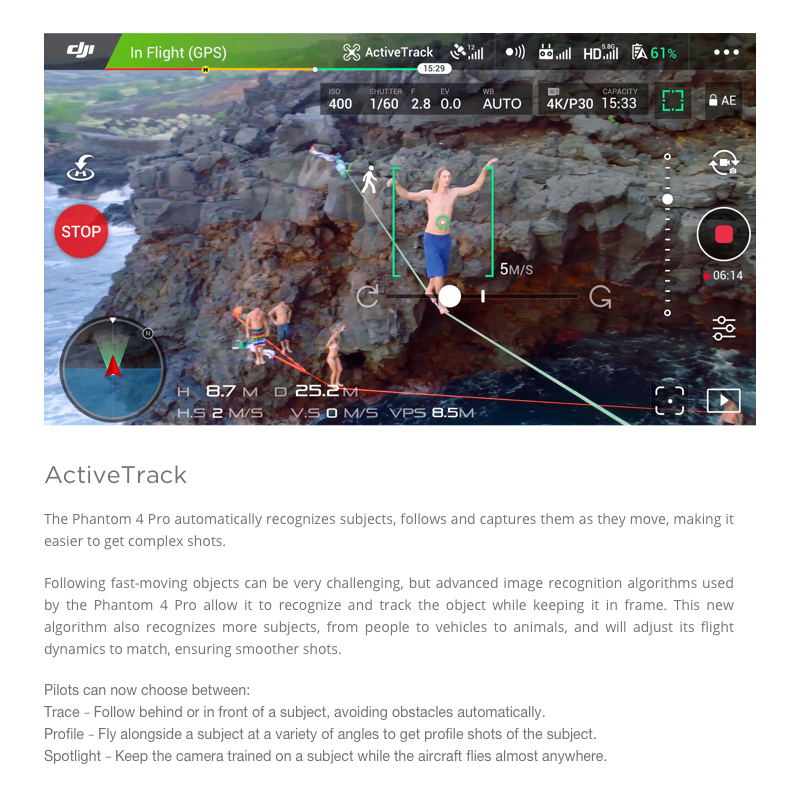 This program has several modes, all of which lock on a subject and help a single operator take quality aerial video while piloting the drone. In Trace, the aircraft flies in front of or behind a subject, avoiding obstacles. In Profile, the drone follows beside the subject . With Spotlight activated, the subject stays in the frame as the pilot maneuvers in any and all directions for a good shot. Spotlight works best on still subjects. How do I know which transmission frequency to use — 2.4Ghz or 5.8Ghz? The Phantom 4 Pro knows. It will automatically choose one frequency or the other to avoid interference that it detects. The pilot also can switch between the two if the signal is interrupted. What is the video transmission range? 4.3 miles. Are range extenders available? Yes, but professional installation of FPVLR range extenders by DJI-trained DroneNerds technicians is recommended. It’s economical and takes only a few days. What are the advantages of Draw? 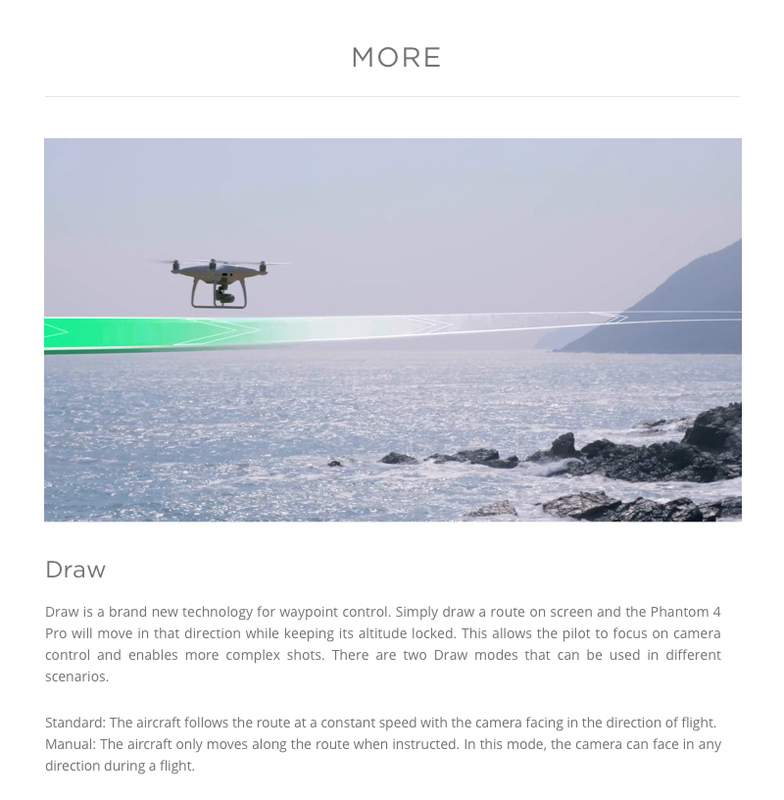 To use Draw, simply use a fingertip to draw a route on an onscreen map, and the Phantom 4 Pro will follow it. That leaves your hands free to concentrate on capturing video. 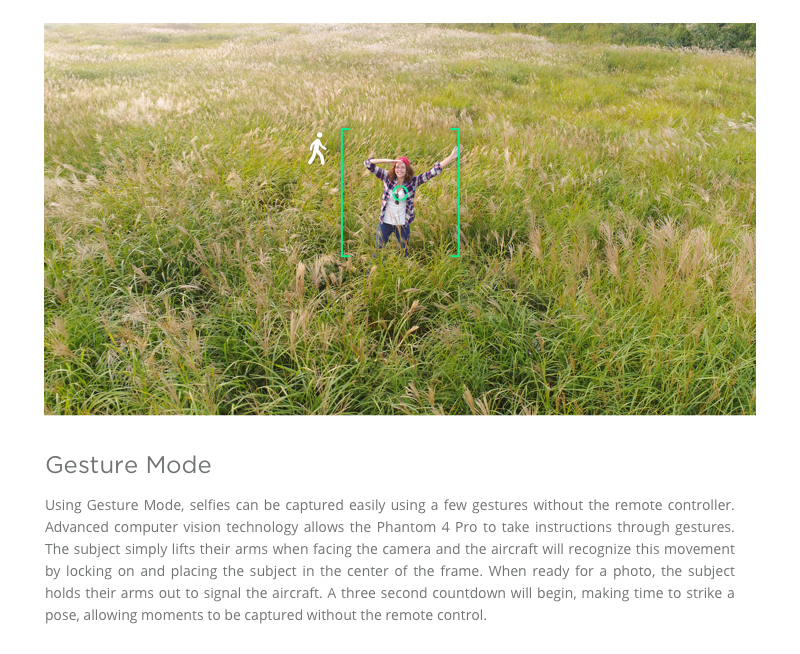 In Standard, the camera points forward as the drone moves forward. In Manual, the drone moves along the route only when you tell it to, and the camera can point in any direction. How does the Phantom 4 Pro use its memory? The P4P can go back to the precise spot where it had been shooting after returning to base for a fresh battery. It remembers where it took off so that it can return home. And it records its route as it flies, so that if Return to Home is activated, it retraces that safe route back to base. Can the P4P shoot aerial selfies? Sure. Just give it the appropriate hand commands. It will recognize them and do the work. How do I continue to fly if a compass or an IMU fails? 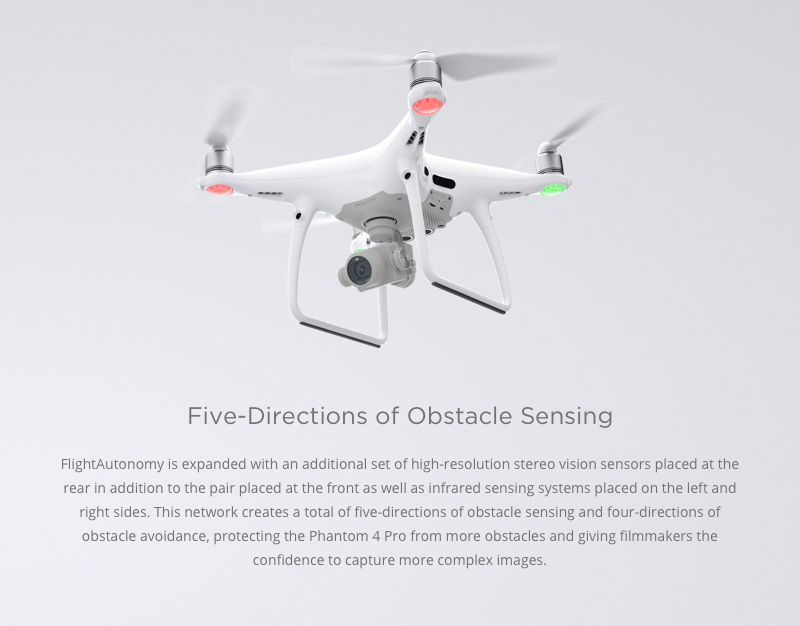 The Phantom 4 Pro has dual compasses and dual IMUs. 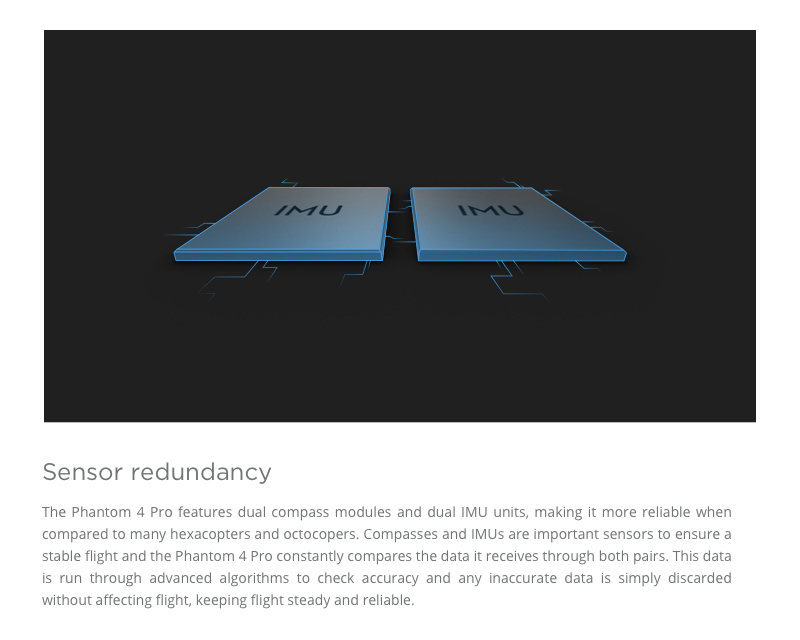 If either a compass or an IMU fails, the redundant sensor takes over, making the Phantom 4 Pro extremely reliable. Does obstacle avoidance work during Return to Home? Yes, whether you activate Return to Home or the flight program activates it when it realizes the battery is low or the signal has been lost. Why are they called Intelligent Flight batteries? They really are smart little things. They prevent overcharging and excessive draining, both of which damage lesser batteries. They even slowly discharge power during storage to keep the battery healthy. 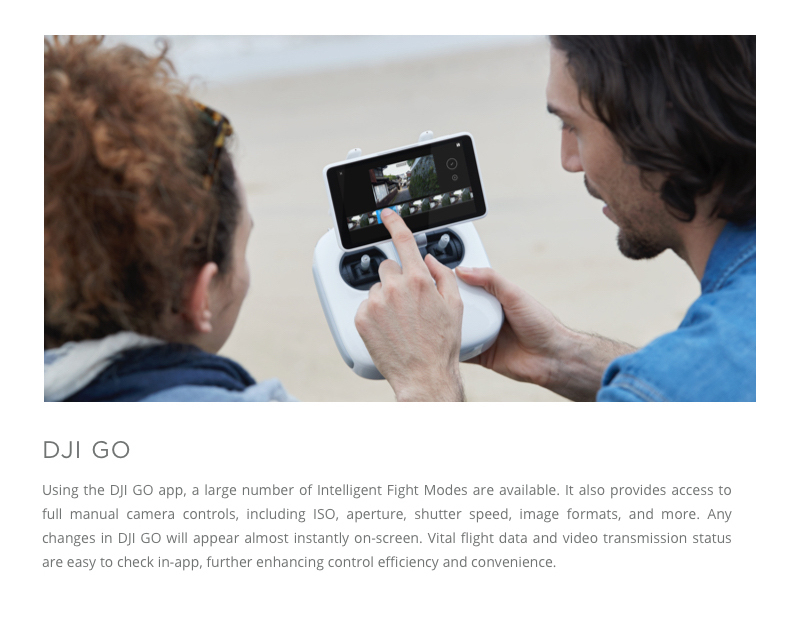 DJI Go shows how much power is in reserve and warns if reserve power is in danger of falling too low to get back home. Is landing difficult? Not really. 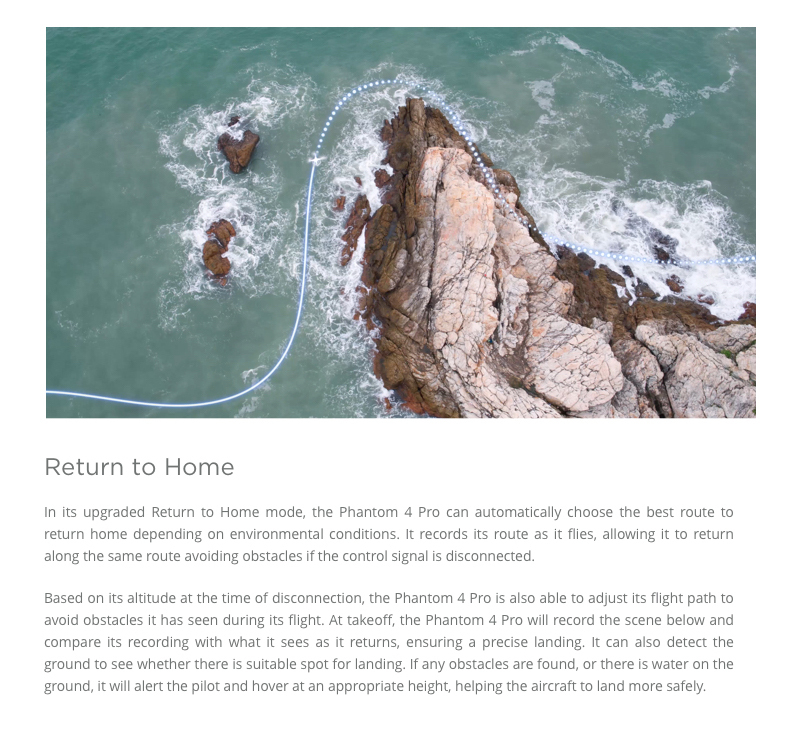 Certainly, experience helps, but the Phantom 4 Pro memorizes its takeoff point and recognizes it when it returns to base to make landings smoother. Catching your drone upon its return is not the safest practice, but the Phantom 4 Pro’s sturdy, fixed landing gear simplify that task — especially helpful if you’re filming over water and are landing on a boat being pitched by waves.